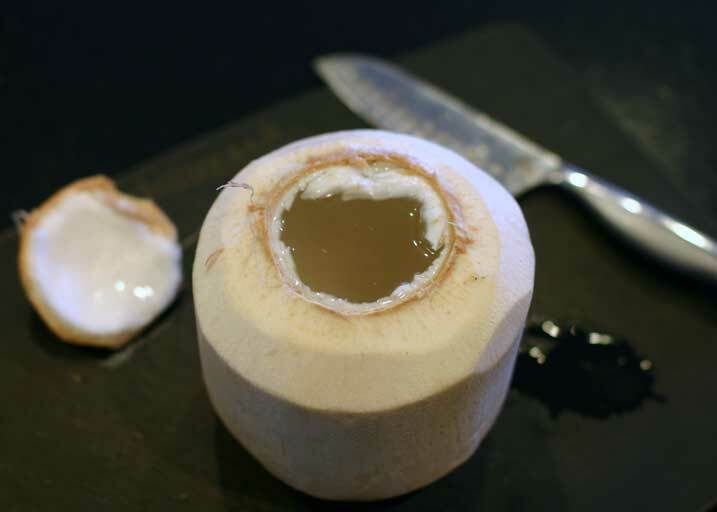 Open your coconut with a sharp knife. If you don’t know how, run a quick search on YouTube. (There are over 500 videos up there already, but I promise to make you my own video as soon as I can.) Pour the water from the coconut into a glass. If there are any bits of husk floating in it, filter the water through a mesh strainer and then set it aside. With a soup spoon, gently scoop the coconut flesh from the shell. If any of the flesh has some of the brown husk stuck to it, you can usually scrape that off pretty easily with a small spoon or paring knife. Measure a half cup of coconut flesh and dump it into your blender, then pour in a half cup of the coconut water you saved. You can save any remaining flesh or water in a covered jar in the fridge and use it within a few days. 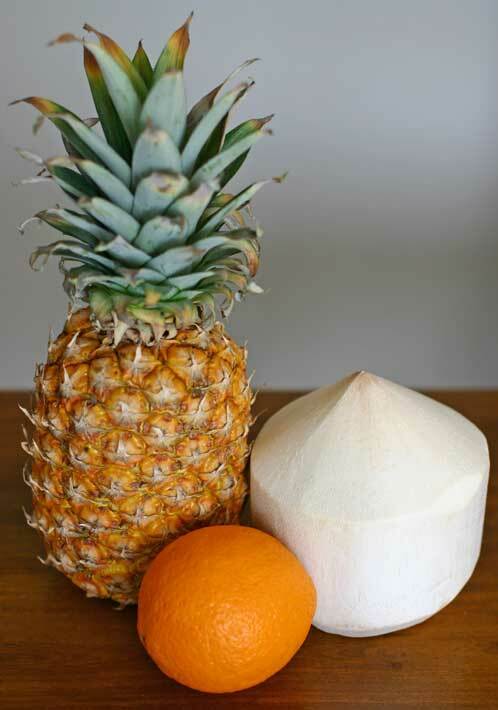 Chop the three pineapple slices into smaller pieces and add them to your blender. If you have a high-powered blender like a VitaMix, definitely include the pineapple core, as it contains beneficial nutrients. When you peel the orange, leave as much of the white pith as possible for the same reason, then chop it into eighths and add that to the blender as well. 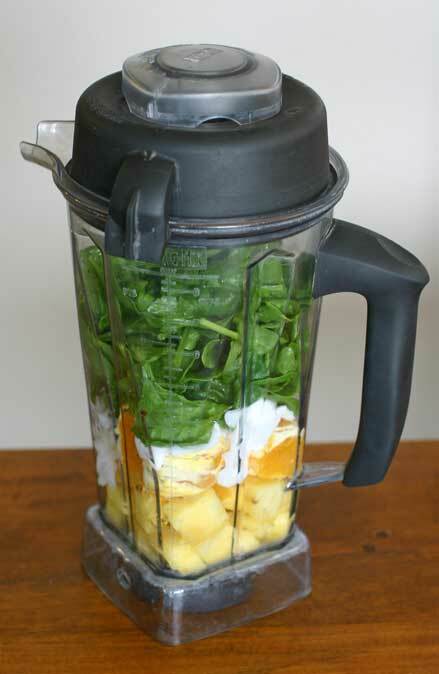 Pour in the baby spinach leaves, hemp seeds and crushed ice, and then blend on high until smooth. 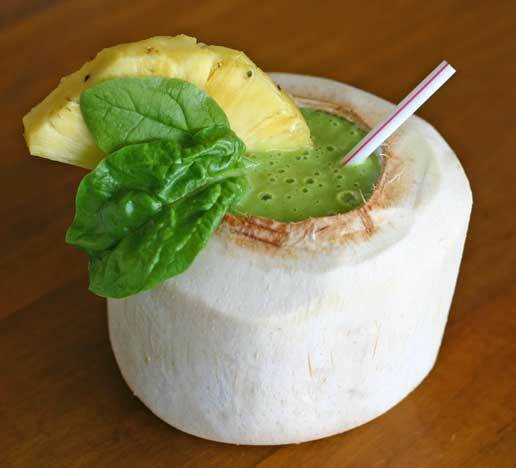 If you’d like to be fancy, you can pour the smoothie back into the coconut shell to serve it, as I did for the photo, and garnish it with another slice of pineapple and a few more spinach leaves. However, a simple glass will do just fine. This recipe makes two large servings. Enjoy the smoothie, and the rest of your day! Pineapple also contains a bunch of vitamin C, and it is a substantial source of manganese as well. Another special benefit of pineapple is that it contains the enzyme bromelain, which helps with digestion by breaking down proteins. Spinach requires no introduction, does it? Vitamin A, vitamin C, vitamin K, folate, calcium, iron, niacin, zinc, dietary fiber, even protein. I could go on, but I think you get the point. Coconut is special because it contains medium-chain fatty acids that are easily metabolized by the body, producing energy instead of body fat. 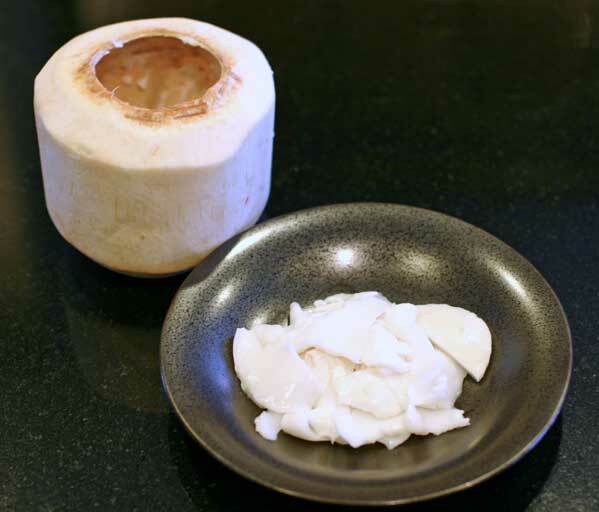 Coconut’s lauric acid is good for the immune system, as well as brain and bone development, which is mostly likely why it is the most abundant fat in human breast milk. Coconut water is celebrated as “nature’s sports drink,” because it’s high in rehydrating electrolytes such as potassium, sodium and magnesium, of course without the added sugar and frighteningly fluorescent food dyes. 8 Responses to "Green Piña Colada Smoothie"
Yum! I have also read that the bromelain in pineapples is good for inflammation. I always try to eat extra when I push my body too hard. Good to know, thanks Marissa! What a yummy recipe! On a nice cold day it warms me up thinking I am drinking this nice healthy cocktail. Just have to close my eyes and picture I am sitting on the beach somewhere. This looks delicious! Where do you get your coconuts Stefanie? Thanks, Aubrey! I just pick them up at WholeFoods in the produce section.